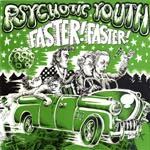 The Psychotic Youth - Faster! Faster! This is the first album from Sweden's Psychotic Youth. It's a great garage rockin' release, and includes one sunny surf instro to boot. As much a rockin' instro as surf, "Surfin' Jamboree" sports an intense energy and lots of twang, but not a lot of what makes up the surf sound. Great fun, highly infectious, and spiced with shouts of joy.